Lawrence J. Ellison (born August 17, 1944) is the CEO and founder, Oracle Corporation. Smithsonian Institution Oral and Visual Histories, Oral History Interview with Lawrence Ellison (24 October 1995). Triumph of the Nerds: The Rise of Accidental Empires (1996), 47"00.
article in The Wall Street Journal (5 March 1998). Statement in 1999, as quoted in "Oracle's Talking: Should You Be Listening?" by Jeff Sweat in Information Week (7 February 2000). As quoted in "Ellison: Oracle remains unbreakable" CNN (21 January 2002). If an open source product gets good enough, we'll simply take it. So the great thing about open source is nobody owns it – a company like Oracle is free to take it for nothing, include it in our products and charge for support, and that's what we'll do. So it is not disruptive at all – you have to find places to add value. Once open source gets good enough, competing with it would be insane. … We don't have to fight open source, we have to exploit open source. Financial Times interview (18 April 2006). The computer industry is the only industry that is more fashion-driven than women's fashion. Maybe I'm an idiot, but I have no idea what anyone is talking about. What is it? It's complete gibberish. It's insane. When is this idiocy going to stop? 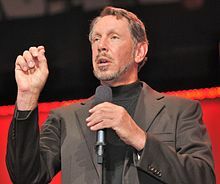 Referring to the term "cloud computing" in his Oracle OpenWorld 2008 speech, as quoted in "Oracle's Ellison nails cloud computing" at cnet (26 September 2008). On the previous managers of Sun after Oracles take-over, in "Special Report: Can that guy in Ironman 2 whip IBM in real life?" Reuters (12 May 2010). Evan Elite : Lesson #4: Break Through That Wall. This page was last edited on 24 August 2018, at 14:30.